It seems every time I go to the liquor store to pick up a new bottle, I always set my sights on a bottle of Clyde Mays, intrigued by what may be contained within, only to end up purchasing something else. Well, I've finally decided to cure my curiosity, and I picked up a bottle. Clyde Mays advertises itself as an Alabama Whiskey. In doing so, its label notes that, in true Alabama tradition, this whiskey contains a cinnamon spice with hints of green apple. Cinnamon is not that uncommon in spicier bourbons or ryes, but the green apple notes were a bit intriguing. Upon opening the bottle, though, it was clear that these were more than "hints" of green apple. The nose gave of a very strong sent of green apple, particularly reminding me of green apple Jolly Ranchers. It was certainly unique, as I've never noticed such a scent in any other whiskey I've tried. Upon my first sip, I immediately noticed the green apple flavor to match the green apple nose. Again, it tasted to me like green apple Jolly Ranchers, as though a handful of them had been added to the barrel. When I mentioned this on Twitter, Clyde Mays responded to me, attributing this to Granny Smith apples added after the aging process. According to their web site, the whiskey is aged for 5-6 years. Afterwards, juice is extracted from apples, and natural apple "essence" is "gently folded into aged bourbon." While I'm not sure what apple "essence" is or what it means to "gently fold" something it into the bourbon, there's no question that the apple flavoring stands out in this whiskey. It came across as a very sweet whiskey for this reason, perhaps to make it a more Southern-style whiskey. I didn't dislike it; it just struck me as oddly sticky sweet and fruity. The label also promised a cinnamon spice, which it delivered. It had a very distinct Red-Hots cinnamon flavor, and this I found very enjoyable. It didn't come forward until the end, and it did so in a well-tempered fashion--not so much that it overpowered, and not so little that it was barely noticeable. 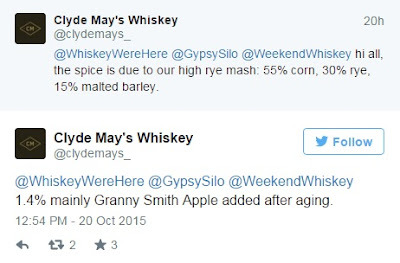 Clyde Mays (again through Twitter) attributed the spice to its mashbill consisting of 55% corn, 30% rye and 15% barley. I also noticed about halfway through my first pour that a dark cherry flavor lingered at the back of my throat, a bit muted but definitely there. Interestingly, I found myself enjoying this whiskey more after it was open for a while, primarily because the sticky sweetness subdued a bit, allowing the more traditional whiskey flavors to come forward and intermingle with the apple, cinnamon and cherry flavors that otherwise had dominated. Overall, I'm glad I tried Clyde Mays, and I more than appreciated their interaction on Twitter. However, while I enjoy bourbons for their sweetness (particularly as compared to single malts), this was a bit much for my taste. It was a very drinkable whiskey, and it would be very enjoyable over ice on a Summer evening, but it's not something that I would drink every day.